Tansen was the capital of the Magar kingdom palpa, one of the most powerful regional principalities before the rise of the Shah dynasty. It even came close to conquering Kathmandu in the 16th century under the leadership of Mukunda Sen. Local Magar kings lost influence in the 18th century and Tansen became a Newari bazaar on the important trade route between India and Tibet via the Kaligandaki River and Mustang. 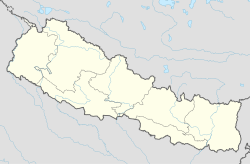 Because it was a district administrative center of the Kingdom of Nepal, Maoists targeted Tansen several times during the Nepalese Civil War, including a major assault on the historic Durbar (palace) compound in 2006. The town enjoys a moderate climate with temperatures rarely exceeding 30 Celsius (86F) or going below freezing. Besides trade, local Newars are known for traditional metalwork and producing dhaka cloth used in traditional jackets and topis. The most important landmark is the octagonal pavilion "Golghar" in the middle of Sitalpati, the main market square. This site was added to the UNESCO World Heritage Tentative List on January 30, 2008 in the Cultural category. The city was affected by an earthquake on 25 April 2015. The United Mission Hospital in Tansen was expected to receive many patients in the aftermath of the severe shaking in the town similar to earthquakes that occur in Japan. A presentation by missionaries was held on 6 May 2015 at the United Mission Hospital in Tansen to share their experiences during the earthquake. ^ a b "Missionaries to share experiences in Nepal at May 6 luncheon". petoskeynews.com. petoskeynews.com. 27 April 2015. Retrieved 1 May 2015. ^ "Nepal earthquake: Newly-weds among Britons caught in disaster". BBC News. BBC News. 26 April 2015. Archived from the original on 1 May 2015. ^ Gardener, Chris (26 April 2015). "Former Hamilton vicar and wife make contact after quake". stuff.co.nz. stuff.co.nz. Retrieved 1 May 2015. This page was last edited on 26 December 2018, at 03:53 (UTC).